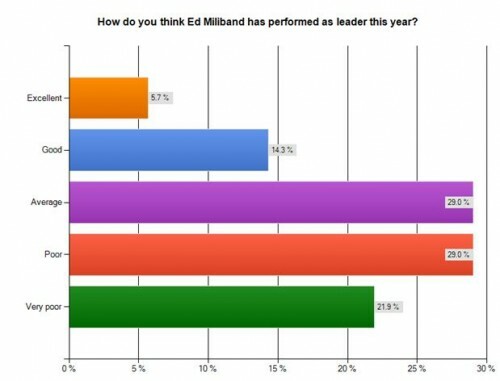 Ed Miliband’s performance was Average to Poor in 2011 – that’s the verdict of LabourList readers in our end of 2011 survey. 29% of those who voted believed that Miliband’s performance had been Average in 2011, compared to 29% who thought he had been poor and nearly 22% who thought that his performance had been Very Poor. That contrasts with just 20% who thought Miliband had an Excellent or Good 2011 – similar to his performance in December’s “State of the Party” survey. Stay tuned to LabourList throughout the week for the rest of the results from our 2011 survey including shadow cabinet rankings (tomorrow), the biggest event of the year for Labour (Thursday) and your Labour MP of the year (Friday). 743 people voted in our end of year survey between December 23rd and January 2nd – thanks to everyone who took part.